I am also doing continued freelance with Rite Publishing on their Lords of Gossamer and Shadow game, projects in the works for Christopher Lockwood’s, Weathered Kingdom and at some point, I am trying to do some test work for a video game company. 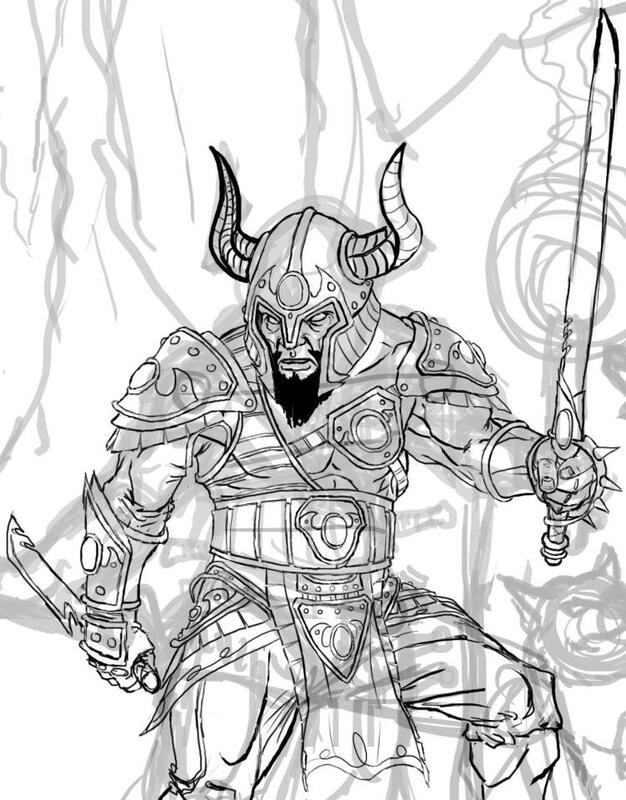 While all that is happening, I am continuing on personal work and pieces for my mentorship under Jon Schindehette (Art Director, Wizards of the Coast/Dungeons & Dragons), which I meant to post about getting, but alas, time got away from me. The image above is a tight crop (of a non-focal point) of my first project with Jon. He hasn’t seen it yet, because the piece keeps getting pushed to the back burner, regrettably. I am really liking this painting, and am tired of sitting on it aside from a few people seeing the progress shots and giving me input, so I want to at least tease it a little. So, needless to say, I am busy and hence, this blog has suffered for it, but I felt you all deserved some sort of update. No, no, not the demon; The PACT crowd-funding campaign is LIVE! Here’s your opportunity to impact the freelance industry in a positive way. You need not be an artist to contribute. There are great perks/prizes for contributors of any ilk, at many levels; from stickers to having yourself and another painted by the pros. As an aside, this will not benefit me directly, in any way. Rather, this group/website aims to educate clients (and the general populace) on what is fair and appropriate in contracts and rates, while also cultivating a culture which respects freelance illustrators and affords them the same level of appreciation as any other contractor. We’re not talking just admiring the art, but rather compensating fairly for work done and offering an in-demand trade. Go to the link to find out more and even listen to a discussion about the goals and hopes of the PACT team. Do this field a favor and donate even just 5 dollars (You’ll get stickers!). You’ll show that even if you’re not a professional artist, you stand behind the freelancers who grind it out everyday. Things have been fairly quiet around here recently. I have been sitting on some awesome (at least to me) news. I am waiting for some things to progress and wrap up before announcing it, but a few of you are already in the loop. I anticipate some really big developments in the future, and we all get to reap the rewards from the work I will be doing (maybe that’s a bit grandiose in scope). I completed the piece that has served as a header for a number of my posts, offering a glimpse of the process. You can view the final here: http://dennisdarmody.deviantart.com Click on the image (It should be the upper left, entitled “Dungeon Delve”) to see a larger version (click on it for a closer view). If you fancy it enough, there are options for purchasing prints, and I would welcome the money! Let me know if you have questions on that. I plan to post the process in a separate area of this blog, as well as feature the image (along with new ones as they are completed) in their own area as well. Last time, I wrote about assessing your weak spots and working to make them assets instead of liabilities. Later in the post, I had plugged a couple of people and resources that I admire. Of course I let those people know and, I had a wonderful surprise and learning opportunity come from it. …very often we spend a lot of time identifying what we “don’t do well”, and spend all kinds of energy and time dedicated to shoring up our weakness…only to make them “less weak”. Where as, as a counter to that, we could exert the same amount of energy and time and work on the skills that we do well, and work at turning those skills to a level of “mastery”. This is even more relevant when folks spend a lot of time building up skills that are weak because someone else thinks that they should – rather than us taking on building up those skills because we choose to. After reading this I couldn’t help but see the logic in Jon’s words and his point stuck in my head and the more I thought about it, the less I find fault in it. Jon and I exchanged messages a couple more times, and eventually the conversation turned into the idea for this blog post; working toward mastery. My last post focused on damage control within your skill-set. Today I want to touch on going all out with what you’re already good at. What good is it to be a “good” landscape artist if you want to create paintings of robots? Sure, there are universal and adaptable skills there and learning to interpret and translate what you see in 3-D into a 2-D format in any form is great practice for an artist, but what if your were already one of the “up-and-coming” robot artists? What purpose would there be in forcing yourself to become a better landscape painter, if you only wanted a career in robot art? Likely, almost none, if any. We have to decide what we want to do with our creative efforts and then go headlong at becoming the best at what we do. Previously, I talked about looking at your work as whole. Doing this teaches you about your skills. Last time it was to find your weakness, this time I want you to focus on what you do best, and what you might not be the best at, but want to be. Those skills/elements are what we need to focus on; the skills that really light our fire. By investing our time working at these skills we can further advance our apt for them, and eventually become masters of them. So, what do we do now that we’ve decided to dedicate ourselves to a particular skill? You work it. You take what you know and you build on it. Learn from other in your field, get critiques, read books, research it etc. You might be thinking, “Wait, that sounds nearly the same as what we would do to better our weaknesses…” you’re right! Creativity is about learning, and expanding our understanding of the world around us, and then learning how we translate that to the canvas, page or other medium. The point isn’t simply to create, but to create what makes us awe. Create that which we can be proud of and then learn where we can make our strengths even better. So yes, in many ways this is similar to building up weaknesses, but it’s investing the time in a different way. Only you can decide what is best for you. You have to decide what you want to do with your creative efforts, and then work toward those goals. What do you consider your strengths? How do you plan to make them stronger? What is your ultimate creative goal? When looking over your projects as a whole how closely do you look at the generalities? I would wager that if you noted some basic elements form each one you would soon have a list, but you would also see that many of the items on that list are repeated. Maybe it’s a color or type of character, or even point-of-view, but ultimately you will find that many of your creations have similarities. It’s not a bad thing, unless you are failing in the same way each time, or succumbing to the same cliché time and time again. What these similar elements inform us about, in my opinion is many-fold. They define our “style”; The things that set our process apart from everyone else even if they were given the same tools, criteria, etc. Those repetitive elements are how we understand and communicate visual language. Other more significant pieces of knowledge we can take away from looking at our works as a collection, are our strengths, and inversely our weaknesses. We can define our style, our go to iconography/colors/gesture/setting/etc. and we can set ourselves up for success in that way. This is our “bread and butter”; the things we know we can succeed at and will come away with favorable and respected results. We know these elements fairly well, and so can adjust them in ways to keep things somewhat fresh but at the same time safe. ‘Safe’ can be a troublesome thing sometimes; it doesn’t teach us as well as when we get out of our comfort zone. This is where knowing your weaknesses is invaluable. When we see what we do well, we should also be able to discern what we struggle with. Maybe those pitfalls aren’t present specifically in any of your works but you infer it by its absence. For example, I tend toward drawing and painting, muscular, typically alpha-type heroic men, depicted in interior settings, often alone. I tend toward warm vs. cool color palettes, and two light sources. My style tends toward realistic rendering of exaggerated anatomy, and sometimes impractical clothing, poses, and weaponry. I can do those things fairly well, without too much struggle. What can be gleaned from that is: I need to practice more with the female form/animals/monsters and exteriors/landscapes. I need to try new palettes form time-to-time, and include more figures, along with more believable/realistic elements. Your weaknesses will be different from mine, depending on craft and a multitude of factors, but can nonetheless be derived form your strengths. What you should take away is not where you fail, but rather where you need to focus your practice. You probably won’t produce a portfolio quality piece with your first venture with new elements and that is perfectly fine, so long as you learn something new. Eventually the hope is that you can produce equal levels of quality across many aspects of your craft. Do yourself a favor, don’t try to tackle it all at once though. While we want to stretch ourselves a bit, we don’t want to hate what we are doing the entire time we are doing it. So take 1 element or a few small ones, and decide the next time you create, you are going to try to work those things in and improve on them. For me, it could be that I am going to stick with my male character, bristling with weapons, and attitude, because i know I can create that, but instead of him existing inside, I am going to put him in an open airy scene. The time after that, I can try to incorporate more figures, etc. I can work up to tackling all of the various things that I struggle with, but not punish myself with trying to master them all at once. If you find yourself struggling to nail down what it is you need to work on, ask a friend, family member, spouse, respected colleague, or even an admired professional in your field. Everyone sees things differently, and so each of these individuals can point out something new. Sometimes joining an online community can pay dividends; immersion will do wonders for improving your skills. Remember, play to your strengths, observe your weaknesses, and push yourself to learn with each and every new effort. What are some things you do consistently well? If your weaknesses aren’t obvious, how can you use knowledge of your strong-points to infer on where you need to work? What groups, communities or individuals do you turn to most when you need input? PS – For you freelance artists out there, I highly recommend following Jon Schindehette’s, “The ArtOrder” (http://theartorder.com/) and purchasing Noah Bradley’s, “The Art of freelancing” (http://www.theartoffreelancing.com/) and following Noah’s blog (http://www.noahbradley.com/blog/) (You can see Noah’s work at http://noahbradley.com). All of these resources are invaluable founts of knowledge, experience and passion for the artistic community. Jon’s career as an artist, art director, mentor and main contributor/moderator of, “TheArtOrder,” has had him dealing with things both new and old; he often freely shares his experience as well as put’s on art challenges, in hopes to enrich the community at large. Noah has a youthful and fresh take on the industry. In recent years he has become a very big name and has released invaluable knowledge in his “The Art of Freelancing” video seminar. It is, arguably, one of the single greatest contributions to the field of freelance art, and is especially fruitful for recent art school graduates. Please take a look at all of their hard work, and continued efforts to educate us all.